I’ve been missing in action on the blog lately but for good reason. We’ve been making velvet pumpkins for our church bazaar for the past few weeks. When I say “we” I mean my 2 sisters-in-law and myself. These are some of the pumpkins that we made. You see, all 3 of us have fallen in love with velvet pumpkins so we thought that other people might buy them at our church’s bazaar which was this past Saturday. I think we made a total of 24 pumpkins in all. Just a few of them were not made of velvet, and those did not sell! I have to admit that I, along with everyone else, love the velvet ones best. I got the idea to make the velvet pumpkins after seeing a video on Facebook. Do you follow our blog’s Facebook page? If not, click HERE. I really have not stopped long enough to write up a tutorial, but you can find the same video that I watched on Sarah’s blog 1915 House. I ordered some (affiliate link) pretty silk rayon velvet in 3 different colors from Amazon. 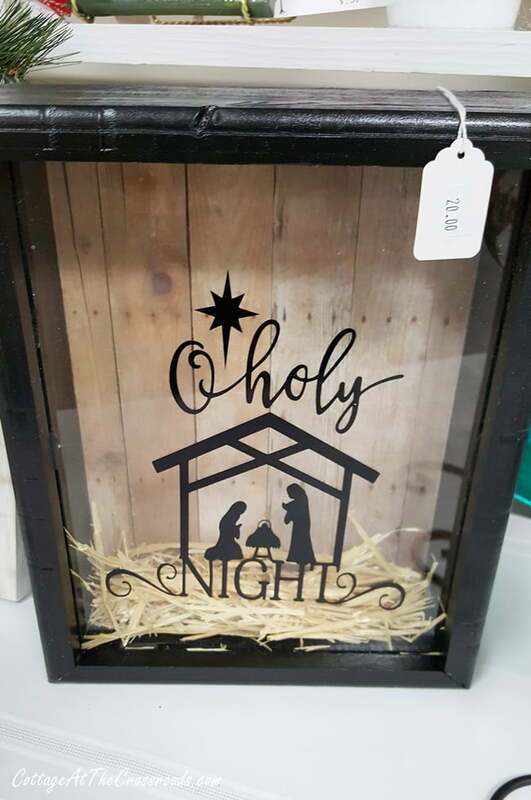 One of my sister-in-laws bought her velvet at Hobby Lobby. 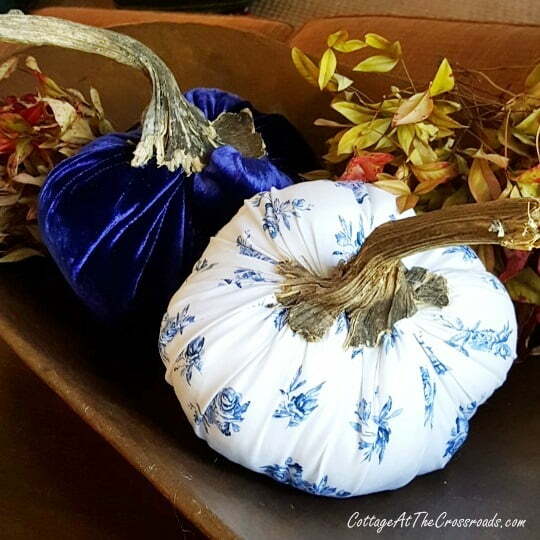 Once you cut your circles out of your fabric, the velvet pumpkins are really easy to make. The hard part, though, is figuring out what you’re going to use for stems. It just so happens that Leo’s cousin grew a field of sunflowers this year so I called to ask if I could go in the field to gather some sunflowers. They said, “You know those flowers are dead, right?” Hehe! 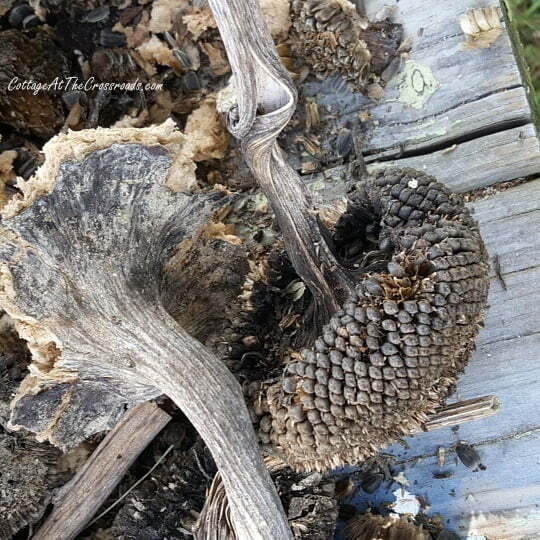 Now I will have to admit that it took a few hours to remove the seed heads from the sunflowers, and then the stems had to be trimmed and then hot-glued to the fabric pumpkins. But they worked perfectly! My sisters-in-law and I had a lot of fun making the pumpkins and most of them sold at the bazaar. 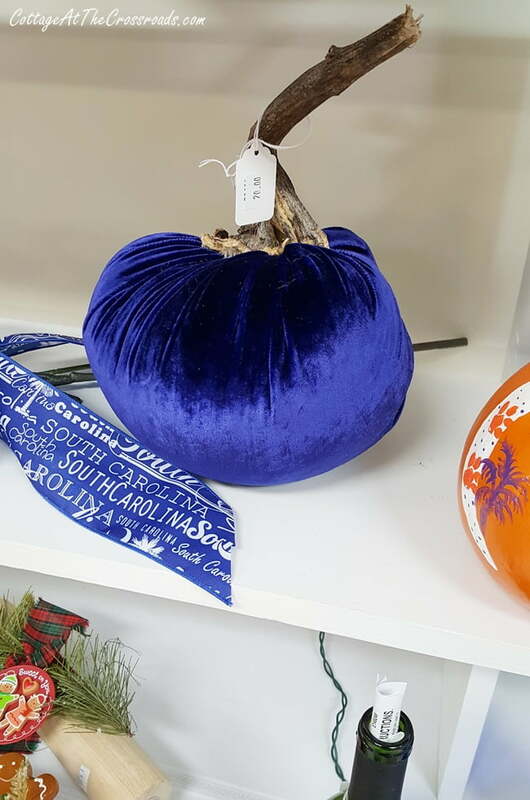 Here is one of the blue velvet pumpkins on a shelf at the bazaar. Our church is small, but it has the most amazing bazaar every 2 years. I’m sharing these photos that I took with my phone. There was a whole section of fall craft items. And another section has Christmas craft items including a Christmas tree loaded with handmade ornaments. Look at these deer made with wooden spoons! And look at this pretty Christmas scene. One of my sisters-in-law made 4 of these really cute hanging lanterns. Table after table of handmade goodness! There were several of these dragonfly wall thingies made with ceiling fan blades, and they were fast sellers. Here is my sister-in-law Jean examining one that was painted in Gamecock colors. Note to self: I must make one of these to put on our garden fence next year. 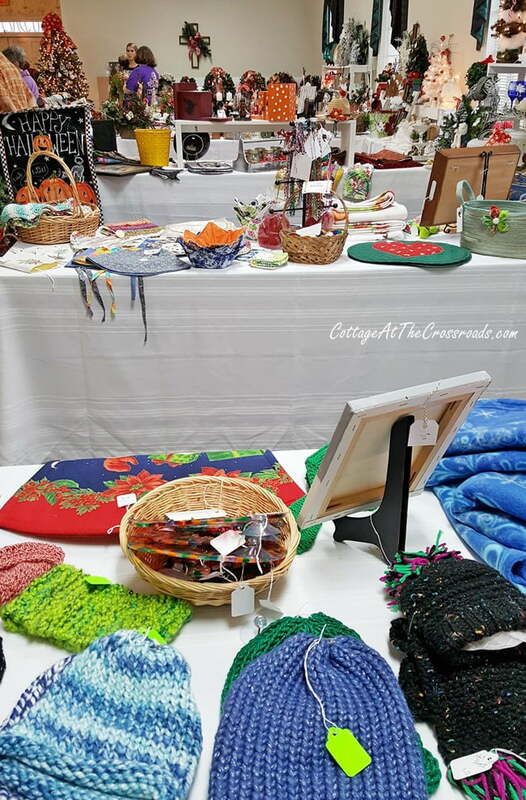 In addition to craft items, there was a silent auction. Here are 2 of the items that were up for auction. So many baked goods were for sale, and lunch was served as well. I contributed a huge pot of vegetable soup for the lunch. It was so heavy that Leo had to carry it in for me! I don’t have a photo but there was a frozen food section where people made and donated frozen casseroles. People stood in line to purchase them because they know how good and convenient they are for working parents. Lots and lots of delicious canned goods were donated as well. I came home with about 10 jars of fig preserves as requested by my mom. They are her favorite. 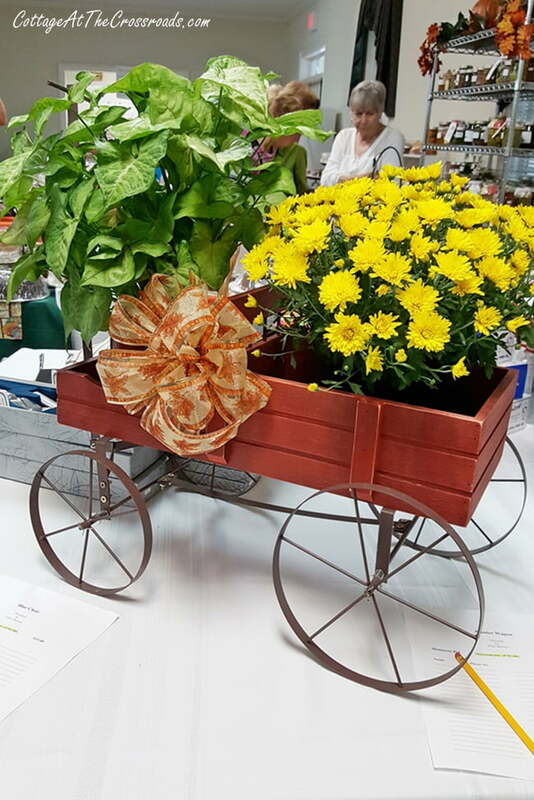 My other sister-in-law Jean bid on this planter buggy and won! Isn’t it the cutest thing? 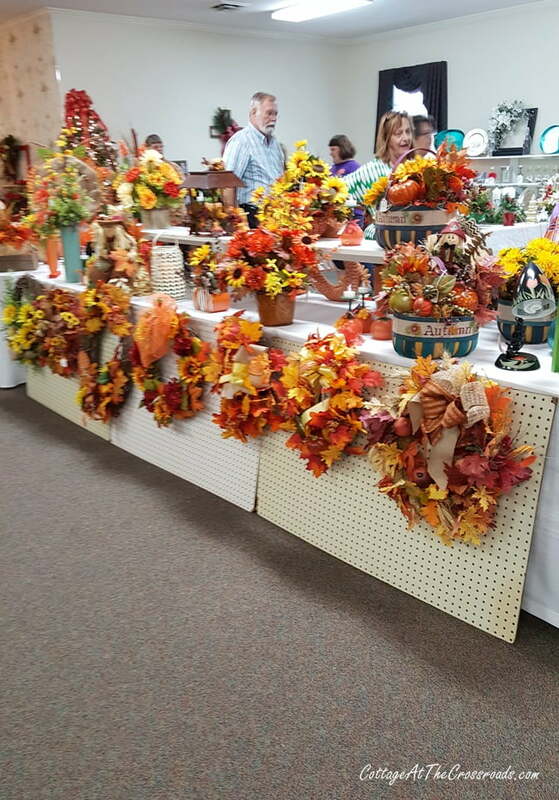 Our bazaar was a huge success, and it was a wonderful day of fellowship and a chance to make new friends. Mark your calendars to make a trip to our town, Lamar SC, two years from now when we have our next bazaar! And since I had a few of the blue pumpkins left over, I’m having a giveaway! One winner will have a choice of either a light blue velvet pumpkin, a dark blue velvet pumpkin, or a blue and white pumpkin. The giveaway is open to residents of the continental US only (due to shipping rates.) Just leave a comment on this post and we’ll draw a name this Saturday, Oct. 14. Good luck! Love love those velvet pumpkins! Church Bazaar’s are the best! And your pumpkins are beautiful. Wow! I would have loved to see this church bazaar. You did a wonderful job. That soup was probably a big hit. Throwing my name into the hat if I am not too late! Cute pumpkins! I saw some recently and thought they were adorable. Would love one! That is an awesome church bazaar!! I’m pea green with envy- it looked like so much fun! My husband’s little family church used to have a ‘Chicken Pie Supper ‘ every year with crafts and usually a quilt that was auctioned off. I so miss that. I love all the pumpkins – even the printed one! Love seeing the pics of all the crafts! I, too, would have been in line for the frozen casseroles! What an awesome idea! Autumnlicious!!! What a great assortment of things to sell. Handmade is the best! Beautiful!! Love following your blog!! Your pumpkins are beautiful, Jane. 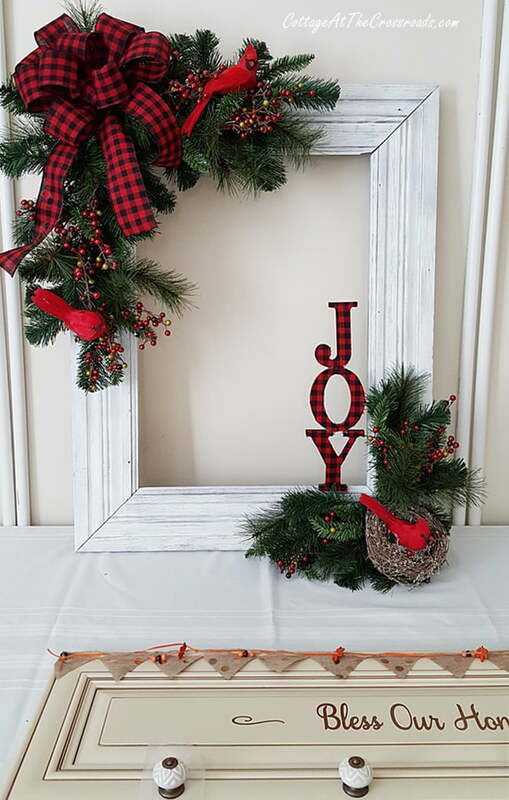 I love reading about your crafting and decorating ideas. Love your pumpkins!! Neat stems!! Very pretty pumpkins. I really like to go to church bazaars, they usually have the best items! I would love to win a velvet pumpkin! 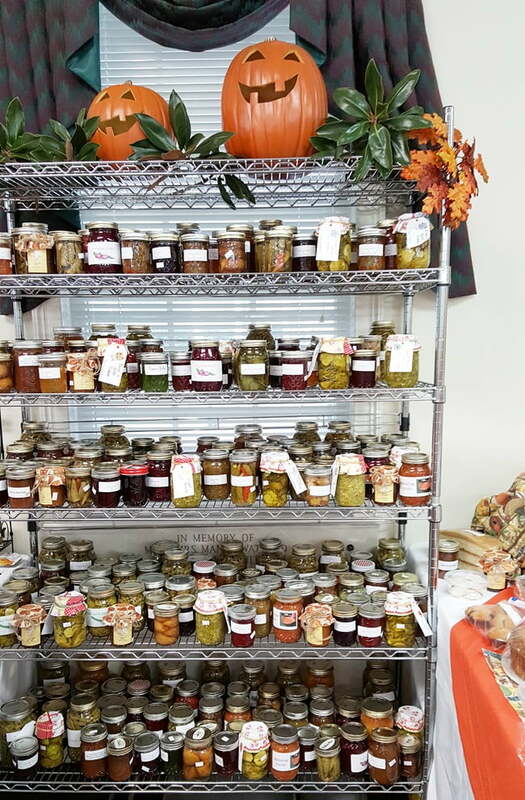 I’m so glad the Fall Craft Fair was a huge success. 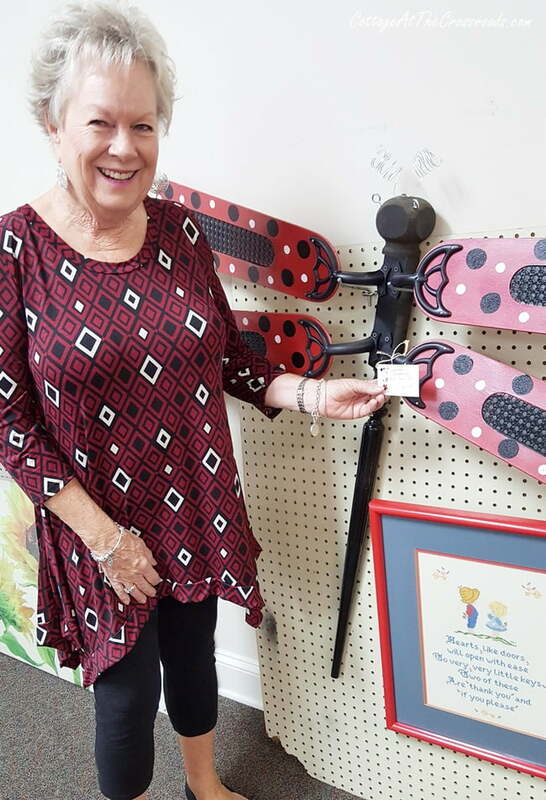 It looks like there were a lot of donations, as well as a lot of great crafts for sale. What a fun giveaway. Who wouldn’t want one of these cute pumpkins! Your pumpkins are so stinkin’ cute! You have me thinking about and wanting to try my hand at making them, but I know mine would end up looking like a Pinterest Fail! That sunflower stem idea is genius! These pumpkins are so perfect with their sunflower stems, what a great vision you had to use these for the stems! Thank you for the opportunity to enter. Thanks for all of the photos of your wonderful bazaar. It’s easy to see why it was such a sucess! Pumpkins are adorable! Great ideas! Your bazaar was the best yet. I hope I get to come for the next one. You ladies worked so hard, but I bet that you had lots of fun. Thanks for all of the pics so we could really understand what it was all about. 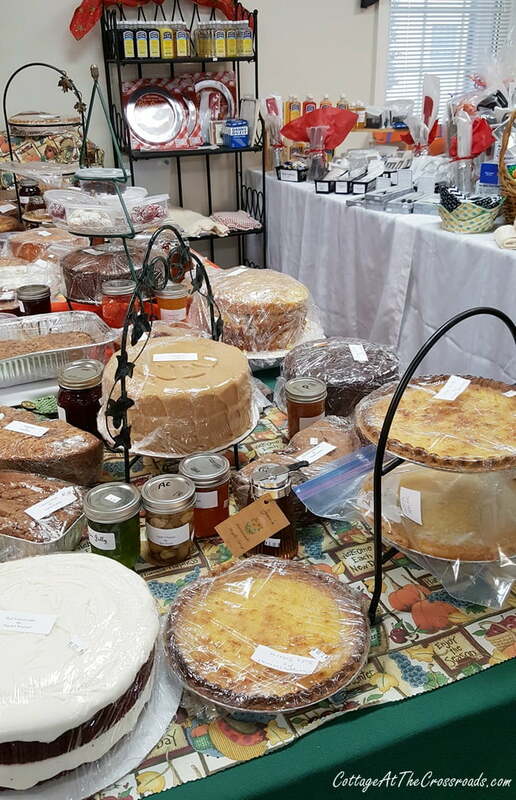 I really enjoyed seeing all of the crafts & food. Thumbs up on the pumpkins that you girls made, they were beautiful. I love the velvet pumpkins, especially the dark blue ones. They are gorgeous! We have to wait 2 years before the next bazaar? Let us Bunko girls know the date, and we’ll head that way. Looks like some really unique items. Love your pumpkins. I may try to make 1…. maybe! Thanks Jane. Looks like quite a craft fair! Church ones are always the best! And what a selection of things to choose from! Also, your pumpkins are lovely! Oh I would love to have been there. Good job on the velvet pumpkins. I love that dark blue one. Gorgeous! Jane, your pumpkins are fabulous!!! So clever to use the sunflower stems. You have inspired me. Your church bazaar looked like so much fun. 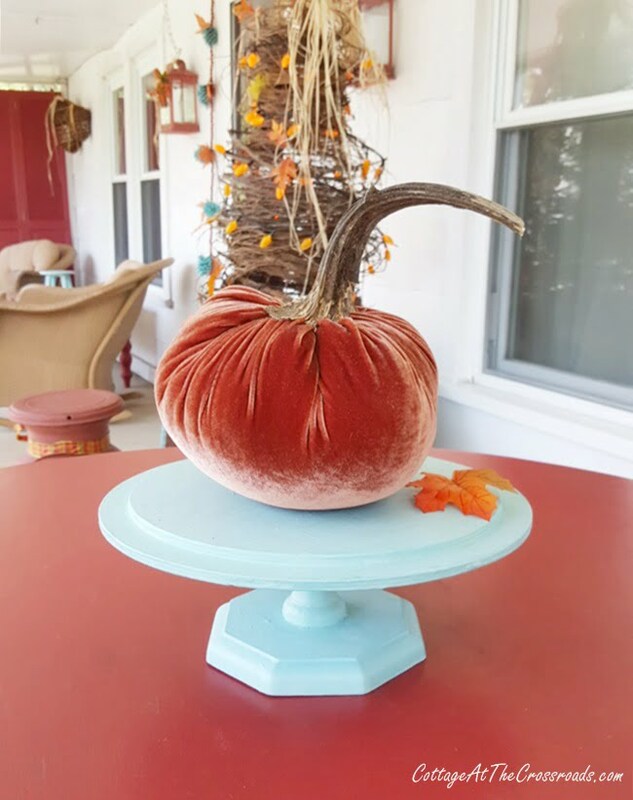 The velvet pumpkins are so beautiful and what a great idea to use the sunflower stems…I have saved many pumpkin stems and have yet to make one! 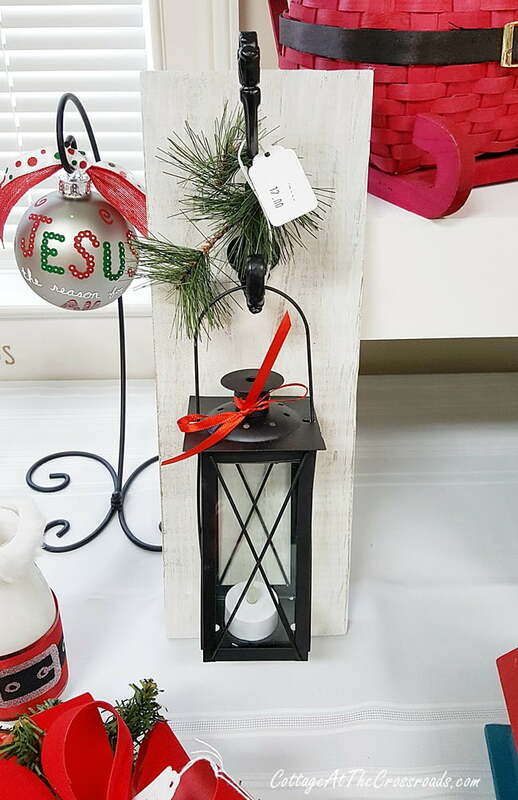 The items in the Church Bazaar are so cute, from your sister in law’s lantern to those ever so cute wooden spoon deer! Looks like the Bazaar was a huge success!! Love the pumpkins. I would love to win. I love your pumpkins. I also have sunflowers . Will try to get stems from them. I live in Utah. I would love to come to your next bazaar. Had to “google” Lamar to see where it is. I’m from NYS near Canada but a road trip in October 2019 to South Carolina sounds good to me! I simply love church bazaars. They’re the best places to get handmade items. Have a great week. Hi Jane! I love the velvet pumpkins. I have wanted to try my hand at making these and you have inspired me! Marking my calendar for 2019 to hit the road to SC for your Church Bazaar!! Hi Jane! Love your velvet pumpkins. I have wanted to try my hand at making some and you have inspired me!!! I am marking my calendar for 2019 to hit the road to SC for your bazaar! Wonderful work on those beautiful pumpkins Jane & very smart to use dried sunflower stems – they turned out so well! I love your community involvement and service. Thanks for sharing. I wish I lived close to you. I happen to live way up in the Northeast region in New Jersey near to NYC. Your church is always hosting amazing events. I remembered your church had to a luncheon for the women that had a different theme for each table that you shared and they were all beautiful and unique as well as your recent church Bazaar with so many stunning displays. I love your velvet pumpkins and how clever you were able to make the stems from dried sunflower stalks. They came out so beautiful! ???? Good Morning Jane. Oh how I love your sweet pumpkins. Love the white with the blue roses. Oh great to use the sunflowers for stems. Loved looking at all the fun stuff at your Church Bazaar too. 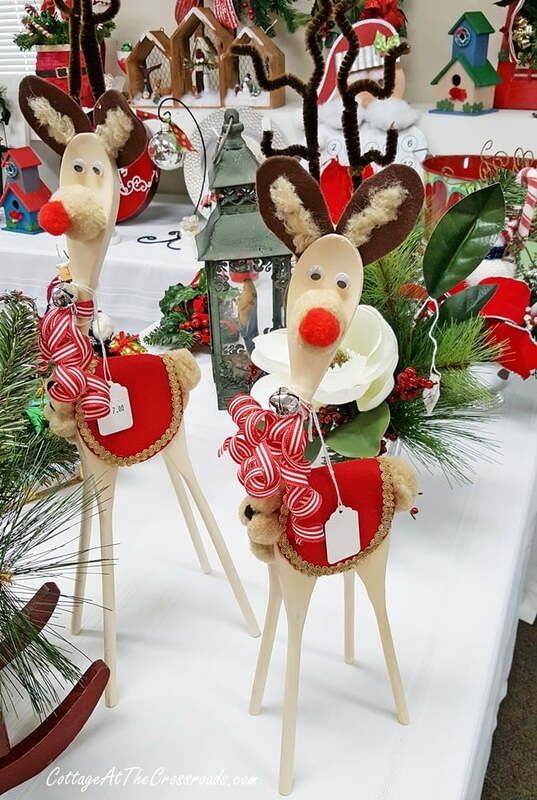 Those sweet little reindeer made out of wooden spoons are just adorable. How fun it must have been. Looks like a great bazaar! I have kept some pumpkin stems for years thinking I would make velvet pumpkins but I’ve never gotten it done. I need to watch the tutorial and get on it! Yours are beautiful! Those are adorable! What a great idea for a family fall craft. I would like to try and make a few with my children this week. Thank you for sharing. Love the sunflower stems. Great idea! I made some velvet pumpkins a couple of years ago. I didn’t have pumpkin stems either. Used sticks instead. I also added vintage jewelry to some of mine. Picked up some velvet dresses from Goodwill to make mine. Would love a sunflower stem to add to mine. Thanks for the chance to win one. Happy Fall! Your velvet pumpkins are beautiful. You are so creative and who would ever think of sunflower stems. They are perfect. What an amazing bazaar! What great prices for handmade items! Love your pumpkins! Jane, I love your pumpkins. I shall have to check the tutorial out.I think the blue & white one is so cute but sadly I can’t enter as I live in England. I know where you are coming from postage is astronomical as well as Customs & taxes. Your church bazaar looked amazing so many talented people.They must be such a nice congregation. Will you be able to share at a later date instructions for making the wooden spoon reindeer? I love the velvet pumpkins. I bought three at Joann’s this year when they marked them down. Your bazaar was unbelievable. So many good bazaar ideas! We had one at our small church for a few years but haven’t in a while. So much work for just a few makers, but I think it is about time again, and I’ll borrow a bunch of your ideas! We never had it this early, but that would really help, to get it done before the busyness of the holiday season. Love your velvet pumpkins! How clever! I love the pumpkins. Your bazaar would be fun to attend. Love the buggy planter your sister-in-law won. Beautiful pumpkins! Loved what you used for stems. I really enjoyed this post and my favorite take away was the frozen casseroles. That is a great idea! The velvet pumpkins are beautiful! I would cherish one if i won! Glad the bazaar was a success! I love homemade items because I always think about the love and time put into making them. Your pumpkins are beautiful and I would love to win one! Brightened my day when I saw that you had a new post. I love going to a good handmade Fall/Christmas Bazaar and yours was Gorgeous!!! 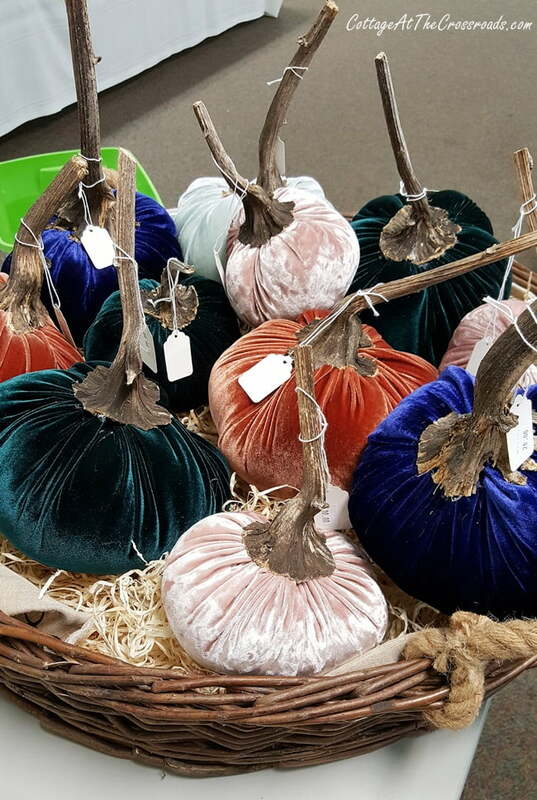 The Velvet Pumpkins are so rich looking and I think add a that great Jewel tone color that moves us into the Holidays. Thanks for sharing everyones beautiful Talents. I would have any of those pieces in my home!!! I would love to come to your next bazaar. I live in the upstate and will have to look up Lamar on my map. I love the velvet pumpkins. I have been wanting one. I love church bazaars. Not only really creative crafts but great food. I love these velvet pumpkins but the retail prices are way to high for my budget. How clever you are to make them and they look wonderful. The pumpkins are so so cute. I love going to things like that. I am always amazed at how creative people are. I also love church bazaars. Beautiful job on the pumpkins. I have been drooling over the blue ones. Thanks for sharing. Adorable pumpkins Jane and brilliant to use the sunflower stems! I’m going to have to remember to save my pumpkin stems this year. Cute, cute, cute and delicious items at your bazaar, wish I was closer! Beautiful pumpkins, Jane, and I know why they were a hit at the bazaar. I have a few velvet pumpkins on my blog–of course I didn’t make them, I can’t sew a stitch! What a great church you have! The reindeer make me smile, as well as all of those delicious looking baked goods! Your pumpkins are so pretty! I would love to try this project. Using the dried sunflower stems was a great idea! Awww I think the blue and white pumpkin is cute! How fun to make them with your sisters in law and for a good purpose too! I love church bazaars and the fellowship. All the homemade crafts and goodies look wonderful and delicious:).